FILE - Sudan's new currency sits behind a window at the central bank in Khartoum, Sudan, July 24, 2011. Last year, the United States lifted long-standing economic sanctions against Sudan. The sanctions included a trade embargo, a freeze on some government assets, and restrictions on Sudanese banks and the ability of foreign banks to do business with Sudan. But instead of revitalizing the economy, lifting the sanctions has highlighted a range of additional steps that Sudan must take to normalize relations and, perhaps, improve the country’s economic outlook, experts say. For decades, Sudan and the U.S. have experienced more tension than cooperation. Low points have included the assassination of the U.S. ambassador to Khartoum in 1973, Sudan’s harboring of Osama bin Laden in the 1990s and the Sudanese government supporting violence against civilians in Darfur, which the U.S. called a genocide. The first of the now-abolished sanctions was imposed by President Bill Clinton in 1997 over Sudan’s alleged sponsorship of terrorism and poor human rights record. “It is never an easy relationship. It’s always a challenging relationship,” said Ambassador Mary Carlin Yates, who served as U.S. chargé d'affaires to Sudan in 2011 and 2012 and co-chairs the Atlantic Council's Sudan Task Force. The breakthrough followed a 16-month diplomatic effort known as the “five-track engagement plan.” High-level negotiators worked closely to make progress in key areas, ranging from counterterrorism to ending interference in South Sudan to improving the ability of humanitarian groups to access conflict regions in Sudan. “When you spend that amount of time working together and seeing that you both do have a common goal to try and reach and try and have some reward at the end for both countries, moving the nations closer together — I think that verifiable process is exactly what changed the relationship,” Yates said. Workers wait for customers at a market in Khartoum, Sudan Nov. 11, 2017. Sudanese leaders hailed the U.S.’s decision to lift the sanctions, but the impact on Sudan’s economy and its people remains unclear. Magnus Taylor, an analyst with the International Crisis Group’s Horn of Africa Project, said Sudan is struggling with hyperinflation and rising wheat prices following the removal of government subsidies. The end of U.S. sanctions has not been enough to offset those two factors. “What the Sudanese government hoped was that this would usher in a new era of international investment in Sudan and interest in the country, but it's actually only been five months,” Taylor said in a visit to VOA’s Washington offices. “A lot of companies are still pretty shy to invest in Sudan, and the economy is really in a bad place at the moment. So the investment environment is pretty bad,” he said. Sudan now wants to capitalize on the thaw in its relationship with the U.S. and ask to be removed from a State Department list of State Sponsors of Terrorism. This may be more difficult than lifting sanctions, Taylor said, since the U.S. is likely to ask for proof that the country has improved its human rights record and ended state-supported violence. “They (the U.S.) want progress to be made on conflict resolution in the two conflict areas. One is Darfur, and one is the conflict in South Kordofan and Blue Nile states on the border with South Sudan,” said Taylor. The U.S. also wants Sudan to be a good partner by helping to stop conflict across the Horn of Africa. That means assisting with the U.S. agenda in South Sudan and elsewhere in the region, Taylor said. 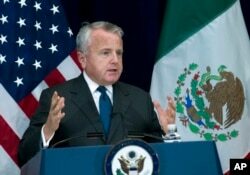 Deputy Secretary of State John J. Sullivan speaks during a news conference, after a US-Mexico bilateral meeting at State Department in Washington, Dec. 14, 2017. 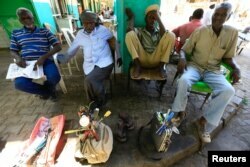 Yates said the Sudanese are eager to move forward toward re-integration into the international community. In addition to removal from the State Sponsors of Terrorism list, they want to join the World Trade Organization and receive debt relief. U.S. Deputy Secretary of State John J. Sullivan visited Khartoum in November, but since then there has been little public evidence of progress, Yates said.